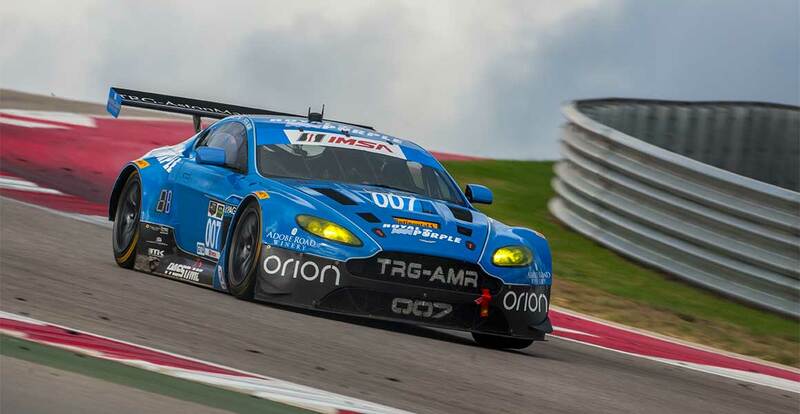 30 September, Gaydon: TRG-AMR, the North American partner team of Aston Martin Racing, is targeting two Tudor United Sports Car Championship (TUSCC) titles this weekend (2/3 October) at the world famous Petit Le Mans race at Road Atlanta. Leading the GTD class championship, the team from Northern California will race its #007 V12 Vantage GT3 in the 10-hour long race with drivers Kuno Wittmer (US) and team-mate Christina Nielsen (DN), who is not only set to become the first Aston Martin champion in the USA but also the first female. Nielsen, from Hørsholm in Denmark, has had a fantastic season in North America’s largest sportscar championship. The 23-year old star has scored podiums at Detroit GP, Lime Rock, Road America and Virginia International Raceway but the competition has been tough. “We are heading into the final race with only a one point advantage over our competitors so now the pressure is on us to finish ahead of the Ferrari and Audi and close out this championship,” said Nielsen. “As drivers, this is what we dream of - a chance to win a championship in the last race of the season when everything is on the line. TRG-AMR has been Aston Martin Racing’s partner team since the start of 2013 and, if successful this weekend, will be responsible for taking Aston Martin’s first major North American championship win. Petit Le Mans starts at 11.00 EDT on Saturday 3 October. Fans in the USA can watch on Fox Sports 2 from 11.00 EDT and fans in the UK can watch live on Motors TV from 16.00 BST.